Never in a million years would I consider myself Studio Manager material. The idea of keeping tabs on >20 projects at any given point freaked me out, and the added responsibility of keeping the whole studio running?!? I remember watching my Traffic Manager back in my agency days and thought that only a special breed people could do this - those that were cool, calm, super-organised with a HUGE amount of brain capacity could do this job. Little did I know, with a little guidance, training, and some words of wisdom, I present you some of the tools that I use as a Studio Manager on a daily basis. For some context, I was previously working in-house at a London-based tech startup called Wonderbly where we create beautiful personalised children's book and manage an in-house creative team of 8-12 pending on how busy it gets. At any given day, the no of request you might receive will range from 0-15 and you WILL need a system if you want to keep your hair and sanity. The additional benefit of having all request come through a form instead of email/slack/words/notes is that you can also do reporting within Google Sheets and track no. of request that comes through, types of request and from the different teams which will provide good insight for forward planning. I have attached an example of how I've set up my request form but make sure to tailor it to what you need and keep it short and succinct. It is also very important to ensure your 'clients' understand how to use the form to ensure you are getting correct and accurate information. So the request has been submitted - what happens next? It's captured in Google Sheets but no one as the time to look at another spreadsheet. This is when we funnel the information off to Trello. I was lucky enough that Trello was already well adopted at Wonderbly making the on-boarding process was a breeze. I used a fantastic tool called Zapier which automates the process and automatically creates a new card in Trello whenever a new line (request) is created in Google Sheets. Once the card has been automatically created, you can then start adding all relevant information onto that card and the card will form your 'brief'. Trello has the added benefit of being able to add comments and attachments which is useful to capture all feedback, discussion etc. Last but not least, a neglected Trello board is of no use to anyone. It is important to maintain and update the board to ensure the system and process is working and flowing. ... or Microsoft Project, or Harvest, or Flow. Choose your poison but if you are going to be organising people's time, you're going to need some help. Resource Guru is my go-to resourcing tool as it's easy to use with its drag and drop functionality and it helps me visualise the capacity of team on a week-to-week basis. It provides a personalised dashboard view to everyone in my team which empowers them as they know what's in the pipeline in the upcoming days/weeks/months. 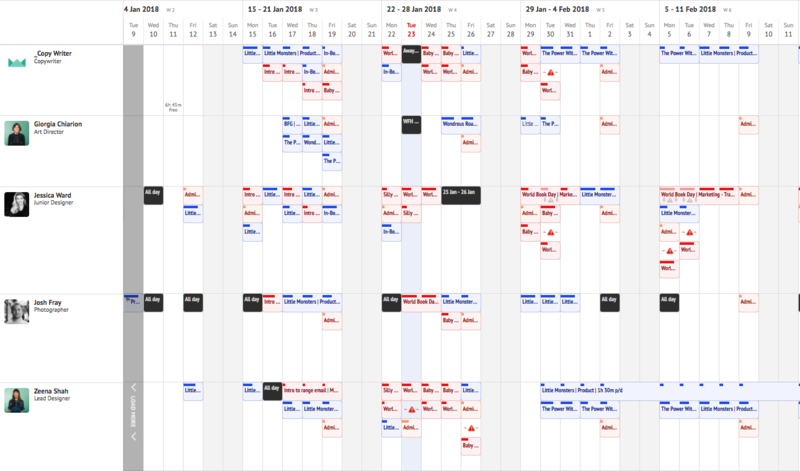 I also use it to put it my teams holiday and days off so it keeps track of availability with no nasty hidden surprises if you've forgotten someone needs to take a well deserved holiday. No, it's not free (but it isn't expensive for what it does) and it will be money well-spent. Other then helping you plan and organise time, I have used it to help on reporting on time spent on a project. It will never be as accurate as doing time sheets (this is a separate topic altogether) but it will help establish a baseline re how much time is required to produced assets and campaigns. They also have excellent customer service!! So there it is, my top 3 tools that I use on a day-to-day basis. Please feel free to reach out and let me know you have any questions or if you want more information about something specific. I love questions and I love the eternal quests of being more efficient.